Updates, updates… I’m now reviewing and contributing to a UK website known as CulturedVultures. It’s fun to have a home. Nothing that appears here will appear on CV but I am going to link to the CVs pieces, whether or not they’re mine. Buried in the International Gallery at the bottom level of the Gallery, the show is a love song to the new artists and artisans of Afghanistan. 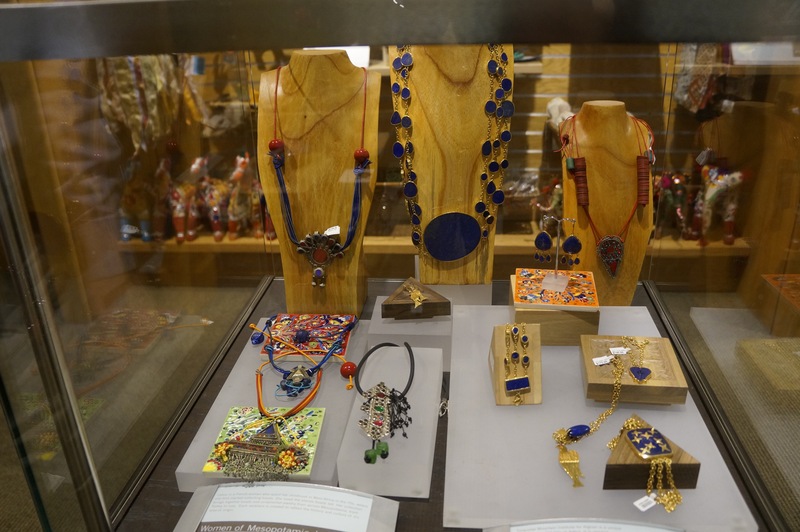 The Afghan jewelry and wood items for sale in the gift shop are exquisite. The necklaces and bracelets are selling out within days of their arrival as well so shop fast. The exhibit will be there for nine months and will have guest artists from Afghanistan. #TurquoiseMountain jewelry for sale in the gift shop at the Arthur M. Sackler Gallery in D.C.
Go and see it if you’re in D.C. You can actually touch the wood and sit on the cushions. How many museums let you do that? This entry was posted in Afghanistan, Asian art, Sackler Museum, Uncategorized and tagged #TurquoiseMountain, Afghanistan, Asia, CultVultures, jewelry. Bookmark the permalink.